For the person having eyestrain and others, this application aims at being able to collect various information with ear. 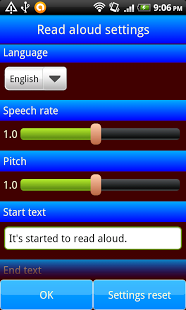 ※This application uses Google TTS (Text To Speech). How to set up is described in the following link for reading aloud the language that Google standard TTS does not support. ※Reading aloud from the point of long press is possible. ※By start timer, you can set start time. In specifications of android, timers is canceled after power off → on. Therefore this application sets timers again in the main screen. ※If you installed this application in internal storage, this operation is unnecessary. If you set several items on the list, this function will parse consecutively in turn from the top. ※In the bad place of the electric wave, you can hear results in parsing, if you parse beforehand in the good place of the electric wave. If you set several items on the list, this function will read aloud consecutively in turn from the top. ※This function are convenient, when both hands are full and screen operation is not possible. This function will start reading aloud at setting time, if you set the start timer on the list at the hour of waking up. ※It may be easy to wake you up, if you let this function read aloud the information that you are interested such as the news site!? This function will finish reading aloud at setting time, if you set the end timer on the list at the time when you may be sleeping. ※You may be able to sleep soundly, if you let this function register old tale sites and read aloud!? A brief description of the TTS engine is described below. 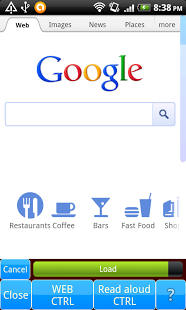 If you want to let this application read aloud the language that Google standard TTS does not support, it is necessary to install the TTS engine corresponding to the language. There are the TTS engines such as follows in Google Play.